Considered the main course of KIALOAs new line IKAIKA, the Hapa SUP Paddle delivers fantastic power and performance without being too expensive. The mid-range paddle of KIALOA IKAIKA Series of Stand up paddles is the Hapa, a flawless combination of weight, strength, and value for almost any paddler, no matter what your price range is. The Hapa is available with two blade sizes. The smaller blade is 7 1/2 inches while the larger has a width of 8 3/4 inches. The KIALOA SUP Hapa Paddle shaft is 50% fiberglass and 50% carbon and features a fiberglass palm grip and foam-core blade. Available in small (7.5 in) and large (8.75 in) blade sizes. Height plus 8 inches is the usual cut (1 shaka overhead). 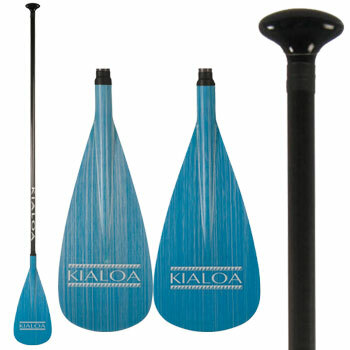 Large Blade Width: 8 3/4"
Small Blade Width: 7 1/2"
IKAIKA Series is KIALOA™s recognition that the field of stand up paddling was missing a line of paddles for beginners, or for more recreational paddlers. It draws its strength and toughness from the discovery of revolutionary Continuous Fiber Reinforced Thermoplastic (CFRT®) technology. CFRT supplements the performance benefits of carbon and glass fibers with the strength of thermoplastic polymers, creating light and yet effectively indestructible paddles at an incredible price.